1. Visit http://www.schoology.com and click Sign Up on the top right side of the screen. 3. Enter your Access Code, which you will receive in an email letter from the District. If you have more than one child in grades 5-12, you will receive a unique access code for each child. At this time, enter any one of the access codes. 4. Once you have completed the registration process, you will be able to access your child's class materials, calendar, groups, and grades by logging in at www.schoology.com (click the Log In button on the top right side of the screen). Your newly created Schoology account credentials will include an email address and password. 5. 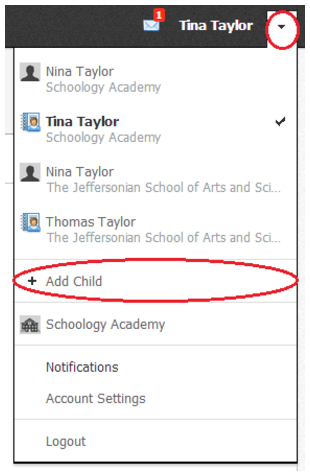 You can also add additional children to your Schoology account by clicking the down arrow on the top right corner of the screen, then selecting "+ Add Child" from the drop-down menu. 6. Once you are logged in, click the drop-down menu at the top, right of your account to select which of your children's materials/grades/groups you would like to view.